On Jan. 18 a group of students, mostly from Catholic high schools in Kentucky, were in Washington, DC. to attend the March for Life. The group was near the Lincoln Memorial, and nearby were two other groups, the Black Israelites and members of the Indigenous Peoples’ March (IPM), both of whom also had events that same day. Some videos made public showed a member of the IPM, Nathan Phillips, standing right in front of one of the students, who happened to be wearing a “Make America Great Again” hat. Phillips banged on his hand-held drum and chanted, while the student merely stood smiling at him. As things progressed, other students in the group began reciting a school cheer in response to Phillips’ chanting. Based upon information on social media, videos that showing only a small piece of the nearly two hours of the entire event, the “Shoot First, Ask Questions Later, Or Not” media sprang into action. The story that dominated was that the students confronted Phillips, but the truth is that the students stayed where they were, and Phillips deliberately walked up to the student and stood there chanting at him for quite a while. The Black Israelites shouted profane and vulgar slurs. Phillips, it turns out, has a checkered past. Some of the offending media have acknowledged their mistakes, and some – gasp! – even apologized for their colossal blunder. The opportunity provided by a group of white boys from Christian schools, some wearing MAGA hats – a gift from Heaven – effectively buried any chance of their reason for being in DC from getting ink or air-time. That doesn’t fit the general media narrative, anyway. And why is the phrase “Make America Great Again” suddenly racist, when it was seen as patriotic when former President Bill Clinton used it? And before that when former President Ronald Reagan used it? These students were not in DC to be an easy target for irresponsible media and the two activist groups to attack. 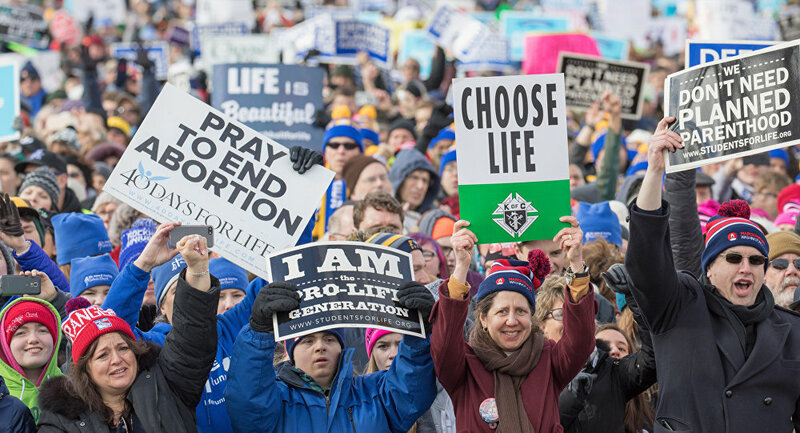 They were there to participate in the March for Life, which is a statement for protecting the developing lives of babies not yet born. Things sure have changed over recent years and decades. Take how we react to unwanted pregnancies, for example. Time was when an unmarried female got pregnant – a fairly rare event, years ago – one of two things usually happened: First, she and the father married and became a family, as they should have. Or in other cases she went to live with relatives in another town, carried her baby to term, gave it up for adoption, and then returned to her home. Thus the floodgates were opened; abortion became a big business. Various estimates place the total number of abortions since Roe from 50 million to more than 60 million, as pregnant women availed themselves of their right to privacy in getting their pregnancy terminated. Differing ideas exist as to when life begins. And most of us would not agree with aborting a human life still in the womb. But that question has not been resolved well enough to establish a definitive rule on when life begins, and after which abortions may not be performed. If there is good news on this horrible practice, it is that the number of abortions in the U.S. is declining. The bad news is that acceptance of abortions at any time is growing. New York just passed a law that means a baby born at 1:15 p.m. was eligible to be aborted at 1:14:30 p.m. Unwanted pregnancies need to be prevented, not expunged. We know what causes them, and there are means to protect against them. The most effective among them is abstinence. It never fails, and it is free.